On average, there are about 1.1 billion medical visits made each year in the U.S. and almost half of them are to primary care providers (family doctors). Family doctors do everything from diagnosing flus and prescribing medication, to even treating chronic diseases such as asthma or diabetes. They help patients make lifestyle changes, such as following healthy diets, quitting smoking, and getting more exercise. The right physician will take the time to get to know you and your family. They should take a special interest in your habits, lifestyles, and interests—all of which could help them with treatments. What type of health insurance you have: Is your insurance part of a managed-care plan that requires you to only see doctors that fall in that network? Will you be able to afford out-of-pocket costs for a doctor that is not part of the network? Background: Do you require a family doctor that has a specific background or medical specialty? Distance: How far are you willing to travel for appointments? Will you be able to make early appointments or late ones? Hours: Do you require a doctor that has evening and weekend hours? Gender: Do you prefer a male or female doctor? Once you have arranged a list of potential doctors, begin calling their offices to get answers to any questions or concerns you may have. Ask if you can schedule an appointment to meet the doctor and check out their facilities. When you visit a potential doctor’s office, make note of whether or not the office staff is courteous and how much time you had to spend in the waiting room. 1. At which hospital does the doctor treat patients? 2. How long does it take to get a routine appointment? 3. Is the doctor accepting new patients? 4. What is the doctor’s availability? What are the general office hours? 5. How quickly can you get an appointment if there is an urgent need? 6. Does the doctor speak the language that you are most comfortable with? If not, is there a translator available? 7. At what point can you cancel your appointment and not be charged for it? 8. Where do the patients go for lab work? 1. What medical school did you graduate from? 2. Are you board-certified in family practice? 3. What is your philosophy of care? Are you treatment-oriented or prevention oriented? 4. Who is your replacement if you are out of town or on vacation? If the doctor’s answers meet your specifications, and the doctor is board-certified, then you are on the right track to finding your family doctor! 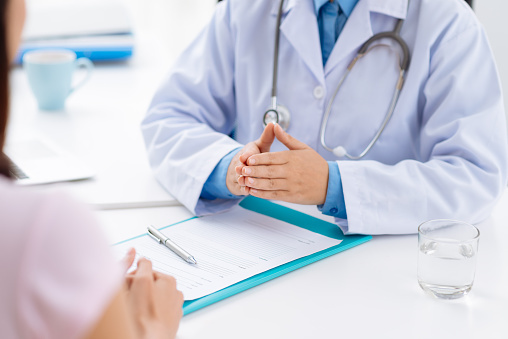 However, it is also important to consider how well the doctor’s personal style and communication skills match your own. Ask yourself how easy it is to talk with the doctor. Take note if they interrupt you before you are able to explain your problems. A good doctor will give you the respect you deserve and shouldn’t discourage you for asking too many questions—in fact, they should encourage you to ask if you have more questions. Finally, take notice on whether or not the doctor takes an interest in you as a person; your physical needs as well as your emotional needs should be met. The final decision is ultimately yours. Trust your instincts when deciding if the doctor is the right one for you. If you have to, make a few visits to the potential doctor’s office and give the relationship some time to develop before making your choice. Take your time when making your final decision. After all, you are not just looking out for yourself, but for your family as well. Stein, L., “Choosing a Family Doctor,” HealthDay web site; http://consumer.healthday.com/encyclopedia/patient-safety-32/safety-and-public-health-news-585/choosing-a-family-doctor-646211.html, last accessed September 1, 2015.